"We are in the business of making golf a more enjoyable game for people that would not necessarily play. It's about fun and playing your best, which can be significantly enhanced with properly fitted golf clubs. We do what is best for your swing characteristics and focus on how the clubs perform for you, the customer." Keep your equipment in pristine condition with help from Twin Pines Driving Range. Whether you need a new grip or a new shaft for your prized driver or for your whole set, Twin Pines can get you back on the course fast. 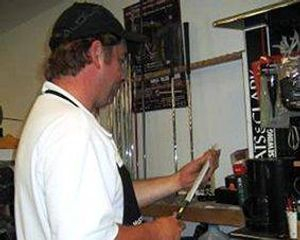 Our expert clubmaker Bill Langdon perform repairs for many New Hampshire golf courses, and often complete repairs and re-fittings for other clubmakers' mistakes. Bill can perform most repairs while you wait, or you can just drop clubs off for your convenience! We believe that the right clubs make a big difference in your game. Since everyone is unique, the right clubs need to be based on you and your swing. At Twin Pines your custom club or clubs will be made to the precise measurements and specifications required to benefit you and your game. We evaluate each person individually, utilizing fitting forms, swing analysis, current set makeup, launch angle, bending profile and energy transfer. We research ball flight and consider swing speed along with many other independent variables of your swing mechanics to fit you perfectly. We work to select the shaft with the right flex for your game. We have hundreds of shafts in stock and many others on request.We also have hundreds of grips in stock including Lamkin, Golf Pride, Winn, Roya and more.